This post is terrifying for me. The thought of even just wearing a swimsuit for the first time in years was difficult for me to handle, so willingly putting photos of myself in one on the Internet is a near impossible task. I don't do swimsuits, and I'm not a huge beach person, but when Surania contacted me about reviewing a swimsuit, how could I resist? 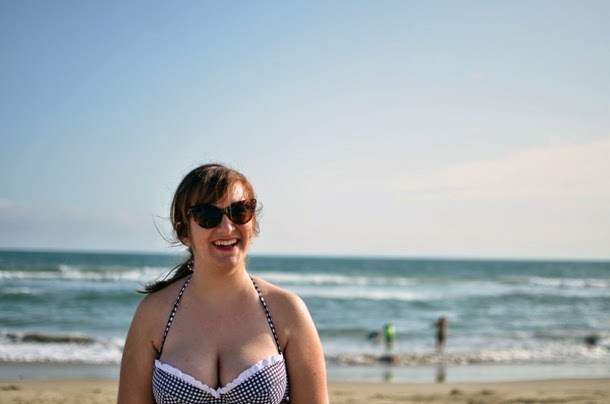 It was a good excuse to finally own a swimsuit, go to the beach with some of my favorite people, and be an advocate for positive body image. I could not have asked for a better company to work with, as Surania offers custom swimsuits and allows its customers to choose the style, cut, fabric, and color that works for them. The feature made me feel much more comfortable about receiving a swimsuit in the mail, and I pretty much knew exactly what I wanted the moment I opened the website. Gingham retro bathing suits aren't exactly original at the moment, but I love the flattering cut and classic pattern. I was amazed at how perfectly the suit fit and how good of quality it is. Not too shabby for my first swimsuit in years. My friends and I used taking these photos as a good reason to go to the beach together, which is a thing we never do. I was pretty self-conscious about being so exposed and knowing that I would be putting these pictures on the Internet, but they all did a great job at putting me at ease and helping me feel confident. I do feel comfortable in my body and my curves, but I can't say I feel comfortable flaunting them and shoving them in everyone's faces via revealing articles of clothing. I much prefer Peter Pan collars and knee-length skirts. That said, I'm glad I got the chance to feel better about being not so covered up, and I'm especially glad that I own a swimsuit again. I forgot how much I actually do like the beach. On to more important things: I chose to watch Game of Thrones with friends instead of the Mad Men finale last night, and I regret nothing. I do plan on watching it as soon as possible though.Those of you who watched it, what did you think? AAAAH! I cannot get over how cute that swimming suit is!!! You look SO GREAT! I looove that swimsuit and it suits you so well! You look AMAZING! If you have a good contact person at Surania I'd love to work with them, what an awesome design idea! That is such an adorable swimsuit! And you look great! First of all - huge kudos for getting over that insecurity and getting these photos up on the blog. It's a gorgeous bathing suit, and you're rocking it! You look great! I need to get over my fear of wearing swimsuits and just rock them! This one is so so cute! I commented on Facebook already, but I forgot I also wanted to say how much I appreciate that your reason for not wanting to put these pictures up wasn't an "I'm so out of shape/my body is so different/etc" reason -- not that those aren't valid, but I think a lot of bloggers might fault to that because they think they should. And I'm glad you're comfortable with your curves! And now I'm stuck browsing swimsuits and wishing they had maternity sizes. Sigh. Such an adorable swimsuit and you look AH-MAZING! You and that swimsuit are a perfect match! Love! !